1. Children should be able to briefly retell the story of Lazarus. Lazarus was a good friend of Jesus’ who became very sick and died. Lazarus had already been dead for four days when Christ raised him. 2. Children should point to Mary, Martha, and Lazarus in the icon. They were siblings and Jesus’ good friends. 3. Older children should be able to explain why this miracle is important to us today. It reveals Christ’s dominion over death, thus reminding us of the potential for our own salvation if we choose to follow Him. The Raising of Lazarus is the most important miracle that our Lord Jesus Christ performed, just before He entered His Holy Passion. It is a great feast day of the Church, and is celebrated the Saturday before Palm Sunday (thus the name Lazarus Saturday), right before the beginning of Holy Week. By raising Lazarus, Jesus Christ appears as Lord and Victor over Death. The miracle is a prophecy in the form of an action – it foreshadows the Resurrection of our Lord, which happened eight days later and, by extension, our own resurrection on the Last Day. This miracle clearly reveals the two natures of Christ, human and divine. Jesus simultaneously displays human emotions, weeping for His friend, and the fullness of His divine power, raising Lazarus’ dead and already decomposing body. Because of the Raising of Lazarus, Christ was recognized by the masses as the long-anticipated Messiah King of Israel. This further enraged the Pharisees against our Lord, and from that moment on they planned to put Him to death – and to also kill Lazarus. Lazarus’ bodily corruption symbolizes the corruption happening to our soul because of our sins. The Orthodox Study Bible, Thomas Nelson Publishing Company, pages 1446-1448. GOArch online article on the Raising of Lazarus and Palm Sunday. OCA online article on Lazarus Saturday and Palm Sunday. Ancient Faith podcast by Fr. Thomas Hopko on Lazarus Saturday. By raising Lazarus from the dead before Your passion, / You did confirm the universal Resurrection, O Christ God! / Like the children with the palms of victory, / We cry out to You, O Vanquisher of death; / Hosanna in the Highest! / Blessed is He that comes in the Name of the Lord! You can listen to the chanted troparion in English on YouTube, chanted by Vassilios Hadjinikolaou. How do we feel when a member of our family or a good friend becomes sick or even dies? What were the names of the three friends of Jesus? What happened to Lazarus? How many days was Lazarus already dead when Jesus came to see him? What did Jesus say in front of the tomb? What happened then? Do we remember any other times that Jesus brought a deceased person back to life? (Jairus’ daughter, son of the widow of Nain.) How about rising from the dead Himself? What does it mean for us that He has this power? (Christ can save us from sin and death.) Always? (No. It is our choice.) How? (He will save us if we choose to cooperate with the Grace of God by obeying His will.) Invite the children to relate examples. Christ stands in the center, with His right hand raised, calling forth Lazarus. Lazarus is shown standing in the tomb entrance, still wrapped up in his burial clothes. Mary and Martha are kneeling in front of Christ and weeping. On the right side of the icon, we see one or two young men rolling away the tombstone, and, in some variations of the icon, starting to unbind Lazarus. On the left side of the icon, the disciples stand behind Christ, looking fearful as well as doubtful. In the background we see the walls of the town of Bethany from where the Jewish people have come out to the tomb site to mourn Lazarus. Some of them have raised their garment in front of their nose to indicate the odor coming out of the four-day-dead body of Lazarus. Icon by Athanasios Clark, Courtesy of the Greek Orthodox Archdiocese of America Department of Religious Education. The basic idea for this craft is to wrap a “body” in strips by some kind of white material . You can decorate your Lazarus further with googly eyes, a smile cut from colored paper or pipe cleaner hands. Inspired by an idea from the blog Crafts by Amanda. 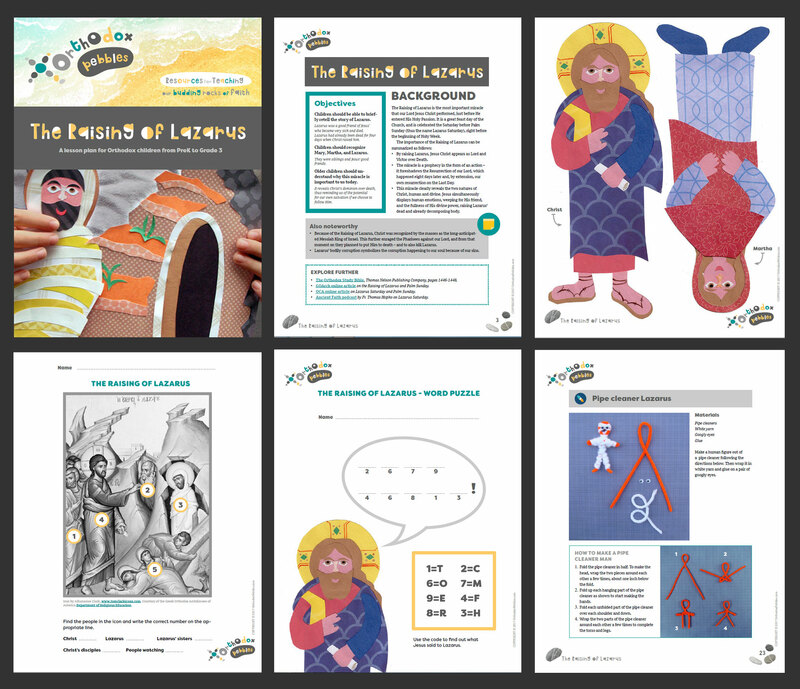 For the complete Lazarus lesson plan including background for teachers, storytelling printables, worksheets, detailed description of crafts, activities, and snack ideas, you are welcome to download our FREE sample.